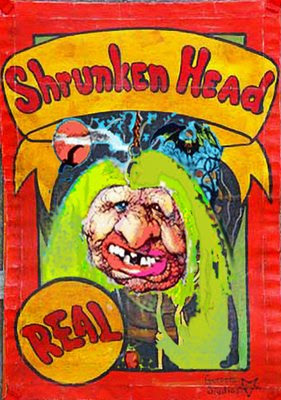 Snail Hollow Gazette: Pshrinking, Pshrinking!! My head seems to be a bit too large at the moment, so I'm having it refitted. Let me reassure you, it seems painless so far, and is only a temporary inconvenience. I hope to have all operations back to normal and working on all cylinders in very short order. In the mean time, please return tray tables to their stored position, and return your seats to their full upright and locked position. Please keep heads and arms inside the ride at all times. Jim, I'm sending another silly singing card your way. This one's a little troublesome. You have to bend it back a little farther to get it to sing, which it does, and quite loudly. I haven't forgotten about the aforementioned link and will provide it soon. Also, I'm planning on driving up to Utah Valley for a conference. If things work out (time, weather, special needs daughter), I could work in some time on Sunday to drive down your way and say howdy. I'd call first to make sure it's a good day. Or at least, not too bad of a day. Heh! That first sentence should say "I'll hang on tight." See---you're not the only one with spelling problems. Not that your spelling is a problem. I'd bend heaven and high water to meet you! Tell us where and we'll be glad to come and find y'all. Snail Hollow is not that easy to find. If you'd prefer to go that route, I'd be just as happy, but let me know. Call my mom. She can give more detailed instructions, times, ect. Okay? Good thing your new hat is an adjustable size one. I'd feel awfully silly if I brought you a normal sized hat, and you had a head the size of a Ken doll. Oh, and by the way, I bought a lot of flower seed to try to re-imagine those spots in my yard where the knapweed was growing. The conference is Feb. 28, so we're still two and one-half weeks off. A lot depends on how matters run. If all's well at home, I'll drive up Friday, stay at a friend's in Provo, attend the conf. on Saturday. If there's trouble at home, I won't be able to come. If I make it, I'll have my son with me. Everybody else stays home because Teah doesn't travel well. What's possible in the "Meet Jim Cobabe" department will depend a lot on how she's doing, whether I have to leave quickly to get home to deal with some difficulty or can stay into Sunday. Can you work with the uncertainty? Because that's my life. Well, uncertainty plays a big role in your life, too, so there's how you'll be feeling to work into the equation. I'll let you know more as things get closer, via e-mail or phone call. I don't eat much, but I travel with my folks, and they have good appetites, so why not work out something tentative for Sunday with my mom? As far as wildflower mix, I would recommend cultvating with a balanced time-release fertilzer, and hope for good weather conditions. I would note that our BLM partners spent some 4 million dollars attempting to revegetate the Milford Flats area that was burned to dust and ashes two years ago. Last spring, they chained and seed drilled thousands of acres with native seed mix. They dropped seed from helicopters over areas that were too rugged to reach with bulldozers. Not one single blade of the reseeded area has come back. Everything has been an utter failure. The only success so far that I can see is th efforts of my partner and I to control invasive weed species. And we worked for a fraction of the cost! Anyway, when you put seeds in the ground, then the Master Gardner, Heavenly Father, is totally in charge. Just never forget that.